I've got another weekly meal plan all organized for you. This week, I'm working on "real" foods - we eat very little from cans or boxes, but still trying to keep it quick and easy. For instance, Monday's chicken, will cook in the crockpot all day and Thursday, I'll throw steak on the grill. Both of those require very little attention from me, but the end results are delicious. Success with meal planning and preparing real foods, has a lot to do with organization and planning (two things I love), but it can get tedious and you can fall into a rut. Also, let's not forget those picky eaters. One thing we DO eat from a box - mac and cheese. It's my youngest's favorite, and since he balances it out with plenty of fruits and veggies, I let it be. 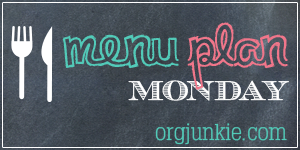 This post is linked up at I'm An Organizing Junkie, for Meal Plan Monday.